Although it specifically states that interviewers should not ask any questions not found in the recommend book (see below for the questions), many members report that they have been asked personal and probing questions, especially regarding sexual behavior. Exercise great care when interviewing applicants for recommends to enter a temple. Make it clear that you represent the Lord in determining worthiness to enter his holy house. No unworthy applicant should receive a recommend. Be certain that each applicant is worthy as a result of living up to Church standards and principles. Acceptable answers to the recommend interview questions ordinarily will establish worthiness to receive a recommend. Do not assume that worthiness to enter the temple at one time is reason for a casual interview later. Discuss the interview questions with each applicant, and keep each interview private. 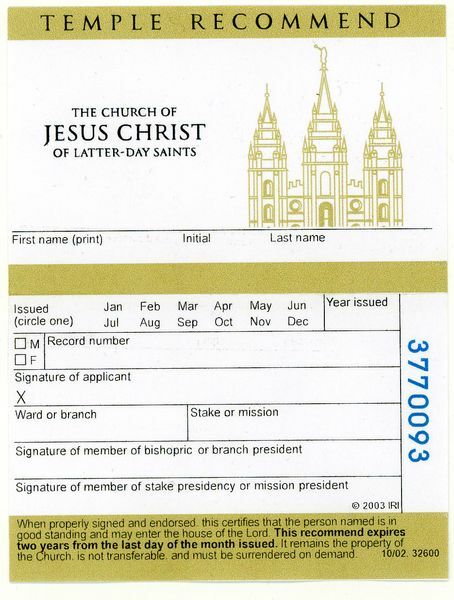 Require an applicant who is not living up to Church standards and principles to demonstrate true repentence before receiving a recommend to enter a temple. When interviewing an applicant for a recommend, do not inquire into personal, intimate matters about marital relations between a husband and his wife. Generally, do not deviate from the recommend interview questions. If, during an interview, an applicant asks about the propriety of specific conduct, do not pursue the matter. Merely suggest that if the applicant has enough anxiety about the propriety of the conduct to ask about it, the best course would be to discontinue it. If you are sensitive and wise, you usually can prevent those being interviewed from asking such explicit questions.